The shares of most major U.S. grocery chains sank after the first day of price-slashing by Amazon at its new Whole Foods subsidiary, but shoppers appeared unmoved by the possibility that food could end up like books — largely the preserve of a single national seller. 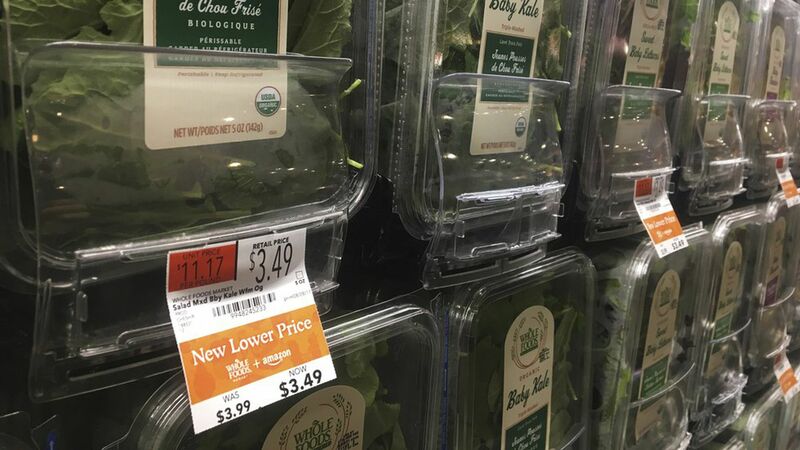 Kroger, Costco and Walmart saw their share price fall in after-hours trading yesterday evening, as they have ever since Amazon announced June 16 that it was buying Whole Foods for $13.7 billion. Costco is down by 15% since then, and Kroger by 28%. Walmart, which is putting up the toughest battle against Amazon, has done better: its share price had been down by as much as 7% six weeks ago, but it has all-but completely recovered since then. This bloodletting reflects the market's conviction that, as it has done in sector after sector, Amazon will largely flatten its new competition in the groceries business. The larger subtext is that Amazon — like the other U.S. tech giants Google, Facebook and Apple — is facing increased political scrutiny as it begins to resemble a retail monopoly, and brick-and-mortar stores face more and more closures. But any inclination to lay low at first was pushed aside by apparent confidence that, like the public's ardor for Amazon itself, shoppers were likely to be grateful for a good bargain. If so, Amazon was right: At least for now, consumers seem a lot less concerned with Amazon's market power, and more with sale prices: a check of shopper sentiment around the country suggests general elation with the Whole Foods acquisition, as one might expect when the price of salmon filets is suddenly 33% lower than the day before, and Fuji apples by 43%. San Diego, CA. : realtor Sheila Mac tweeted, "I went shopping at Whole Foods and for the first time did not spend my Whole Paycheck! Thank Goodness!!" Venice Beach, CA: the LA Times found a similar sentiment at a Whole Foods. Philadelphia: KYW Newsradio's Steve Tawa reported an interesting mixture of reactions at a Whole Foods. Downtown Minneapolis:The Gala apples, bananas, ground beef and rotisserie chicken were all-but sold out at the Whole Foods, per the Star Tribune's John Ewoldt.